Solar Street Lighting System is a lighting system for the illumination of streets & squares and cross roads located in areas that are not connected to the power grid. The standalone solar street lighting system comprises of a Solar Panel, Lead acid battery for Energy Storage, Compact Fluorescent Lamp (CFL) as light source, suitable electronics and hard-ware like pole, battery box for fixing of these sub system. The system is controlled by a controller with automatic ON/OFF time switch, which control the light from dusk till morning or other setting time. 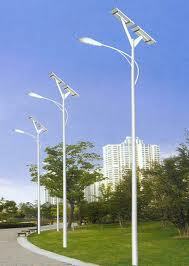 Note high end Solar Street Lighting can consist of LED Lamps instead of CFLs. Read more about Solar Lighting in India Guide- List of Suppliers and Products for Home and Commercial Purpose. These can either be standalone systems or centrally operated. Standalone Street light is a complete system by itself. They contain their own solar photovoltaic cells, battery and lamp and thus an independent system. Centrally operated solar lights on the other hand, are connected to a central power system. They have common solar panels for their group. The solar energy from sun is absorbed by the photovoltaic cells/ panels on the street lights and are stored in the rechargeable battery, after converting the solar energy into electrical energy. During the night time, this energy lights up the lamp on the street lights. Again the next day the battery gets recharged. This is the working principle of the solar street lights. 1) Low Cost – Since solar lights use light from the sun for its operation, it is independent of the power grid. The cost is much lower as compared to electricity costs. 2) Clean and Green – The solar lights are an environment friendly way of lighting up the streets. They use clean energy from the sun for their working, hence there is no pollution and more energy saving. 3) Safe – Unlike the conventional street lights, there are no wires associated with the solar street lights and so there is less risk of accidents. 4) Low Maintenance – The maintenance associated with solar lights are very less as compared to the other street lights. Also Read on GWI Best Solar Lights for Garden Reviews. i)Initial Investment Low High, because of high cost of solar panels, battery & LED lamp. ii) Environment Friendly Less environment friendly, More pollution & carbon dioxide emission. More environment friendly, No emission of gases or pollution. iii) Running & Maintenance Cost High. Electricity cost is more expensive. Low. Almost free as it uses solar light from the sun. iv) Safety Low. Since there are wires involved, there can be a risk of short circuit or other accidents. High, since no wires are associated. Win A FREE SOLAR LIGHT Daily on GWI! This is a non polluting source of electricity & indian govt. giving 30% subsidy on solar power plant..Hurray! Solar street light using LED technology generate a very powerful and targeted crisp white light of excellent quality, which significantly enhances illumination and night visibility.